Melanie Elaine Russell and Austin Cody Skinner were married just in time before goose season starts! 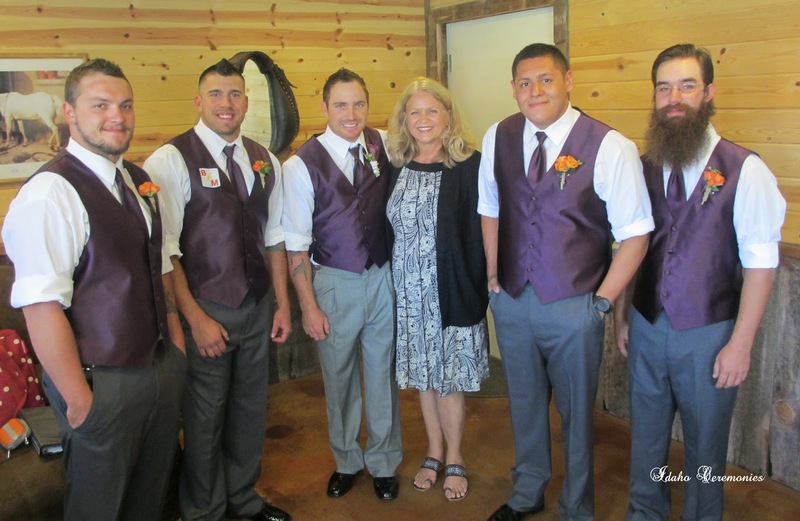 A horse drawn carriage brought Melanie, and her parents, Michele and Scott Cole, to the barn at Eagle Island Event Center as Austin waited for his beautiful bride to join him at the altar. 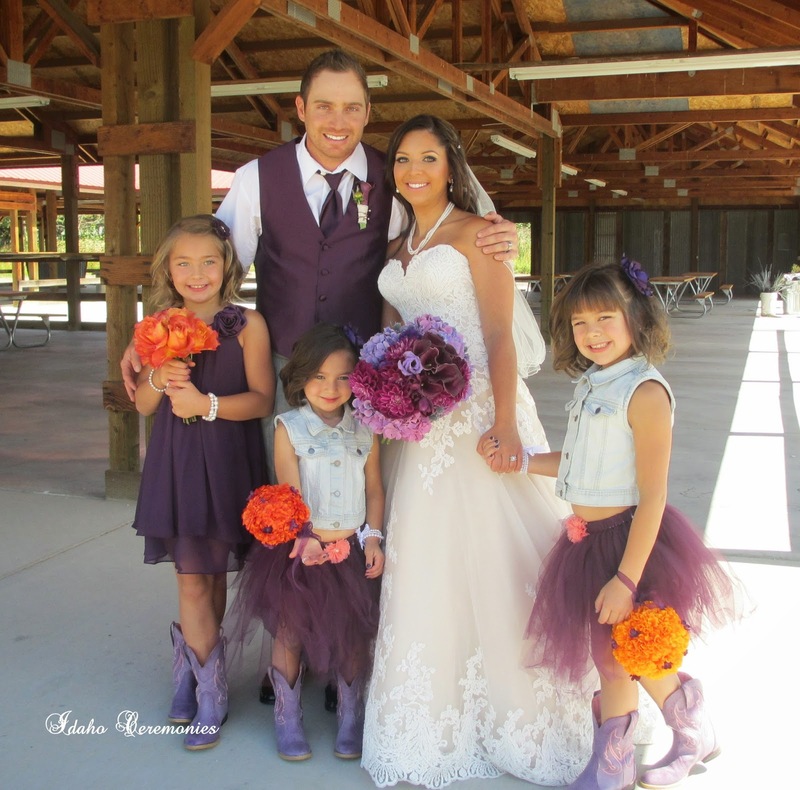 Austin and Melanie exchanged vows and rings, and then, Austin vowed to the girls, Makenzie, Maleah and Miley, that he would guide and support them all of his life. No, not one dry eye, could be seen at the barn. Austin then gave their three daughters rings, just as he had done with their mom, to seal their family unit. Wishing you love and happiness, Melanie and Austin, and Makenzie, Maleah and Miley! The Men and the Minister! 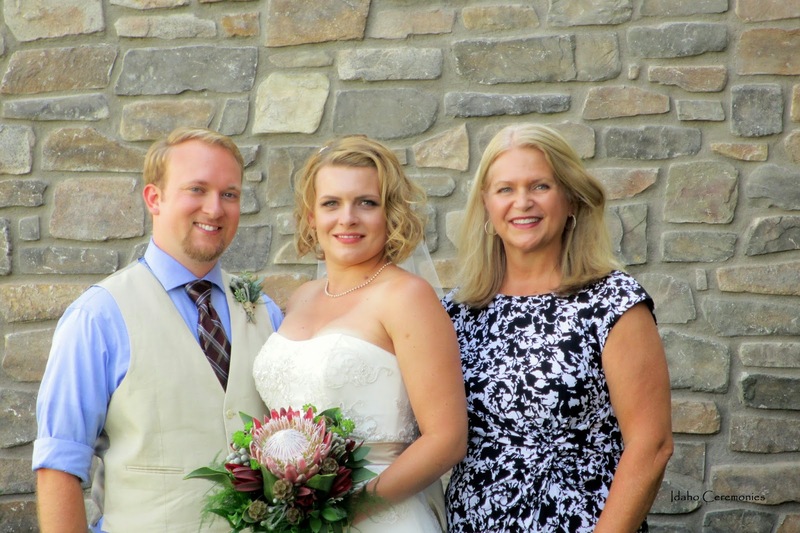 Laura and Casey's wedding took place at a beautiful McCall, Idaho home. It was a fantastic location for the ceremony, dinner and an evening of fun! Laura is the daughter of Bill and Kelly Vick, and Marley and Debbie Fite are Casey's parents. Best wishes for a long and blissful marriage! Who doesn't love Cinnamon Whiskey? The skies opened up and a downpour of heavy rain and blowing winds followed me up Hwy 21 to the wedding of Lauren Myers and Ben Denny at Gray Back Gulch in Idaho City. When I arrived, the skies had cleared and the sun was peaking out between the pines. Lauren and Ben's ceremony took place between two beautiful, tall pine trees, and it was an absolutely beautiful mountain setting for this wonderful couple. Congratulations! Lauren Myers and Ben Denny - The Look of Love! Piper and her mom Candice, married Tyson, on a beautiful Saturday afternoon at the Hilton Garden Inn in Idaho Falls. Candice's family arrived earlier in the week from Kansas, and Tyson's family from Idaho and Nevada, were all together to celebrate as Tyson, Candice and Piper were married. It was a day filled with flowers, love and great food (and oh so decadent cake)! At the end of the evening as the sun was going down, I even captured beautiful Heart clouds floating in the sky. What a beautiful way to give Tyson and Candice a closing to their incredible wedding day. Thank you for asking me to officiate your ceremony and best wishes to you all in the years that are to come! Tyson and Candice | Approaching their first "look"
Tyson, Piper and Candice Sharing a Fun Moment! and see this beautiful sight! even more amazing, as the sun sets, another little Heart cloud appears and floats on it's own! Idaho is filled with love signs!